YASA MPEG/AVI to VCD/DVD/SVCD/MPEG/AVI Converter is used to convert MPEG and AVI to VCD, DVD, SVCD, MPEG, AVI, DivX. 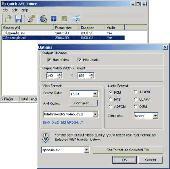 Mpeg to AVI DIVX VCD DVD Converter can help you convert MPEG files to AVI, DIVX, VCD, DVD. The professional edition can support burn VCD. It is very simple and easy to use. High converting speed, wonderful output quality. Abcc DVD to MP4 MP3 iPod MPEG AVI Ripper Pro is a powerful DVD ripper can rip DVD to popular video files including MP4, iPod, MPEG, AVI, and also extract audio from DVD and save it as MP3 file. It can help you play your DVD on MP4, iPod, MP3 player. Torrent AVI Joiner helps you merge/join multiple AVI/DivX/MPEG-4 video files, so you can play them on your iPod, PSP or share them online. Torrent Avi Joiner helps you merge/join multiple Avi/DivX/Mpeg-4 video files, so you can play them on your iPod, PSP or share them online. This program allows anyone to join Avi videos without a tutorial. Without a re-encode process, the application provides fast speeds and an easy-to-use interface.